This article appears in print in the August 2018 issue. Read more from the Seattle magazine feature story here and from the Seattle Business magazine cover story here. Click here for a free subscription. What’s the first record you bought and how old were you? It was a Beatles singles collection. “Old Brown Shoe” was on there, “The Ballad of John and Yoko,” “Paperback Writer.” … I was 11 or 12 and bought it for like 50 cents. How did Giants in the Trees come about? It was after a meeting at the Skamokawa Grange Hall. A call went out for musicians and we were the only four who showed up. What happened the first time you met? I busted out a bass riff that I made up on the spot, everybody picked up on it, one thing led to another and we wrote “Sasquatch.” It just felt natural and right. What do you like about playing with Ray [Prestegard], Jillian [Raye] and Erik [Friend]? They’re really good musicians and there’s a lot of diversity in the sound. It’s not just a straight-ahead rock band with bass, distorted guitar and drums. I like that but it’s fun to play with a slide guitar, or a box guitar, and then a female vocalist, Jillian — she’s pretty easygoing. Being a rich and famous rock star: Fun? Overrated? Fun! I’m not in debt, I pay my taxes, I indulge in some things but am frugal in other things. I just live my life with my wife. Nirvana received a $600 advance when it signed with Sub Pop in 1989. Do you remember what you did with the money? At the time, what did signing with Sub Pop mean to you? It was as if we were legit. Any other memories of Sub Pop — the label or the people? It was the center of the music universe for us. We would come up to Seattle and visit. This always meant also buying pirozhki across the street at Kaleenka Russian restaurant. It is now Le Pichet. Were you surprised when Nirvana hit? I don’t know if I was surprised. For me, it just kind of happened. It was like getting on a roller coaster. [The album] Nevermind came out in September 1991 and we started to explode. By 1992, we were huge and doing world tours. There was all this pressure plus personal things going on and then it all ended [with Kurt Cobain’s death] in April 1994. So much happened in a compressed amount of time. How do you deal with grief? Grief is amazing. It can knock your socks off but in the midst of it, you can also feel a lot of beauty and love. I remember feeling really bad and seeing a dragonfly fly by and just being really impressed by that. Grief is a part of life. 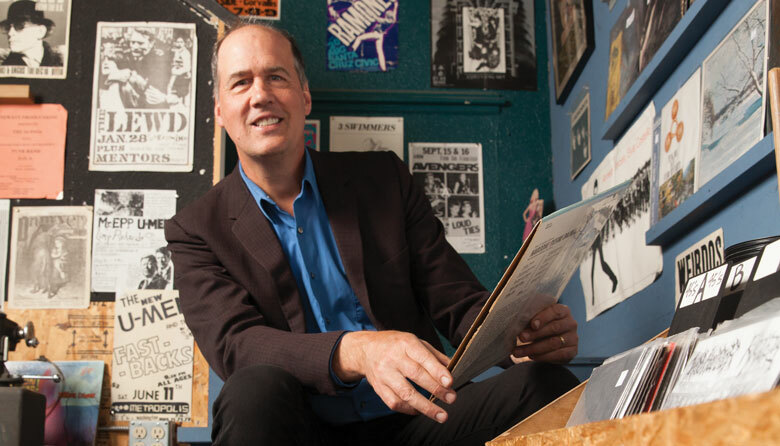 Describe the Krist Novoselic bass sound. It’s kind of one part Paul McCartney and one part Geezer Butler. … I’m also really into John Entwistle. But it’s not about me; it’s about identifying what the song needs. I listen to the vocals, the guitar riff, the drums and figure out the dynamics. The song is the boss. Is there a song you’re embarrassed to admit you love and know all the lyrics to? There are so many of them! Where do I start? Give me your top three. “Mississippi” by Pussycat, “Chirpy Chirpy Cheep Cheep” by Middle of the Road, “The Winner Takes It All” by Abba. What are the components of a good song? Verse, chorus, verse, bridge, outro, maybe a solo and a hook — that’s why they call it that because it hooks you, it draws you in. You have three minutes or less to make a statement, and then you get out. You’re a fashionable dresser. Who designs your clothes? My wife, Darbury, dresses me. She made these pants and this shirt. How would you describe your relationship to money? Money has been very good to me and I’ve never taken on any debt. I’ve always squirreled money away for a rainy day and lived within my means, which has allowed me to do things like buy a general aviation airplane. You’re stuck on a desert island and can have one book, one record and one food. If I was stuck on a desert island the book would be a manual on how to build a boat so I could get off the desert island. The record would probably be Nevermind by Nirvana because it’s been so good to me. And the food would be a bean burrito with cheese, sour cream and lettuce. What has been your scariest creative moment? I never thought of it as being scary but when you make music and put it out and people criticize it or whatever, it’s always kind of scary. But you can’t please everybody. Is there a main driver in your life? I don’t want to waste time. I feel like I’ve wasted a lot of time in my life and I don’t want to waste any more. What four guests would make for the perfect dinner party? [Former Nirvana members] Dave Grohl and Pat Smear, so we could catch up. I’d invite Kurt Cobain, because it would be good to see him again. And Darbury, my wife.